I was recently asked about good places for vegetarians to get their grub on in the ‘burgh. Full disclosure: I am not a vegetarian, but I thought this would be a good question to explore for the masses. The Pittsburgh City Paper‘s 2009 reader’s poll named Quiet Storm the best vegetarian restaurant in their 2009 Best of the Burgh issue. Coming in second was South Side’s Zenith and third, Hoi Polloi on the North Side. 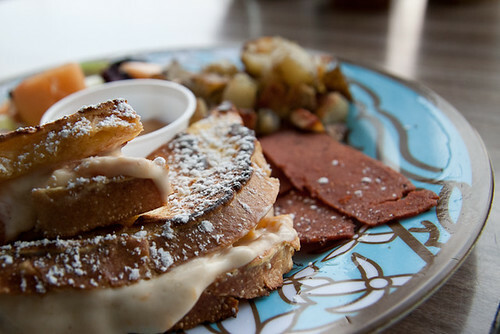 This past Sunday, I visited the Quiet Storm for brunch to see what the fuss was all about. 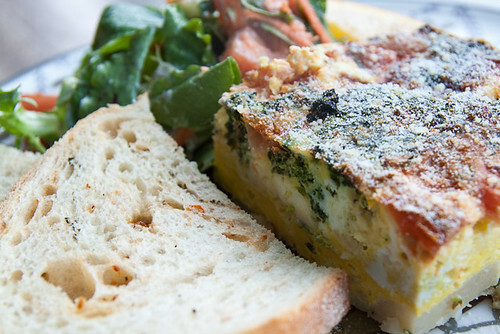 I ordered the frittata, a generous square of eggs, spinach, tomatoes, onions and cheese in a potato crust served steaming hot with sun-dried tomato toast and a salad with dressing that was to die for. My dining partner ordered the apricot stuffed french toast which came with fakin’ bacon, fresh fruit and potatoes. Brunch entrees are $11 and come with coffee, soda, tea or juice. We were impressed by the great quality of the food and the friendly and attentive service on a blustery winter day when everything else felt miserable. The Quiet Storm also offers wheat-free options and they are open to suggestions for future menu items. A few people on the Never Tell Me The Odds board recommended some city favorites with many of vegetarian options: Spak Brothers, Sree’s, Pusadee’s Garden, Big Burrito restaurants, Over The Bar, Double Wide Grill, Green Mango, Tram’s, Aladdin’s, Abay, Paris 66, J’eet, Istanbul Grill and several others. I interviewed a few local vegetarians to get their take on the variety, quality and convenience of vegetarian options in Pittsburgh restaurants. Quiet Storm: Best tofu scramble ever. I’m partial to the country breakfast burrito with tofu scramble and the ginger lemonade (not at the same time, though). Mad Mex (Multiple locations): So many options here. I usually get a spicy Mad Mex burrito with mushrooms or the hummus wrap. The Greek Gourmet (Squirrel Hill): They really do have the best hummus in town. Aladdin’s (Multiple locations): The veggie chili or the falafel are my usual choices. Over The Bar cafe (South Side): Beer and Setain wings! China Palace (Shadyside): Chinese with good faux meat options. I usually go for the hunan stir fried soy protein. Thai Cusine (Bloomfield): Decent thai and home of the inexplicable veggie chicken ham. I usually get the spicy basil noodles. People’s Indian (Bloomfield): Best Indian I’ve had in PGH. I usually get some kind of curry veggie dish, veggie pakora and some yummy naan bread. Yo Rita (South Side): They change their menu and specials frequently, but there’s always at least a couple of vegetarian tacos to choose from and their soup is usually vegetarian too. Kiku (South Side, Station Square): I usually get a couple of vegetable rolls and pieces. They have a pretty good list to choose from. Val finds it easy to be a vegetarian in Pittsburgh, she noted that most restaurants seem pretty informed and open to vegetarian options. A lot of the time waiters/waitresses will even mention non-vegetarian ingredients in a dish before I get a chance to ask (like fish flakes in the miso soup or fish sauce in the pad thai). On any given day you have multiple options for vegetarian “wings” and beer or a vegan cupcake if either are your style. I’d say that’s pretty good. Terra McBride likes to keep it local in the South Side. My husband and I often find ourselves wanting to stay close to home so tops on my list is Zenith. I can’t really choose a favorite item since their menu changes weekly, but their Sunday brunch is simply divine. For $10, you get an entree and unlimited trips to the buffet which always has a myriad of side dishes and sweet breads. Everything is vegetarian and everything is unbelievably good. The funky atmosphere and communal seating only adds to the super hip vibe. Terra also digs the Double Wide Grill where her favorites include vegetarian burgers, honey garlic wings and Caribbean coconut tofu. After spending New Year’s Eve at Mantini’s, Terra noted that they always have a great vegetarian special. Kelly Miser recently moved to Pittsburgh from a small Midwest town and has loved exploring the restaurant scene in Pittsburgh. A lover of Thai food, she frequents the Green Mango in Regent Square, Thai Place II in Shadyside, Lemongrass Cafe downtown and the Silk Elephant in Squirrel Hill. She also gave props to the Square Cafe in Regent Square and the Taj Mahal in the North Hills for great vegetarian options. She also loves Giant Eagle’s vegetable sushi for a quick meal option. Emily Levenson, the Reluctant Vegetarian, decided to join her husband in a vegetarian lifestyle after overcoming some health issues. I asked her about the challenges she has faced and her thoughts on being a vegetarian in Pittsburgh. I think the biggest challenges of being a vegetarian are self-created. And yes, we could have more vegetarian and vegan friendly restaurants in Pittsburgh, but I think you would be hard-pressed to find someone in this city that decided not to be a vegetarian because there weren’t any options. Vegetarianism is a choice, just like any other eating style or diet. A lot of people complain that vegetarian or vegan food is bland, which has never been the case for us. In fact, we eat better now than when we were meat-eaters! We have tried so many new foods and new flavors that eating is a truly enjoyable (and fun) experience. I’m glad I took on this little research project, it seems like it’s pretty easy to have a vegetarian lifestyle in Pittsburgh. Most restaurants are open to the needs of people on restricted diets, providing them several options rather than just one or two.